At Red Hat’s tech conference taking place in San Francisco, the maker of open source software and Microsoft showed a lot of progress to their landmark partnership announced in November. Red Hat, which makes a popular version of the open source operating system Linux, was once feared and hated by Microsoft. Microsoft’s most important customers — big companies — flocked to Linux as an alternative to Windows Server. And that used to be an expensive problem for Microsoft. Not only does Microsoft charge companies to use Windows Server, but Windows Server also means a company is more likely to buy other Microsoft/Windows products, such as its database SQL Server. This led Microsoft to make all kinds of threats against Linux under former CEO Steven Ballmer, even a vague threat that Microsoft could sue companies who use Linux, after Microsoft claimed that Linux violated a lot of Microsoft’s patents. Over the years, those threats allowed Microsoft to get most companies who use Linux in their products to pay Microsoft royalties. But Nadella realised long ago that this kind of threatening tactic isn’t necessary in the new way companies buy their tech, where they rent it all via cloud computing. Nadella knows that Windows isn’t as important to the company as it used to be. And that means he can “love Linux,” bring it into Microsoft’s cloud and make Microsoft’s other products work with Linux, too. As long as companies are using Microsoft’s cloud, Microsoft gets paid. It doesn’t matter if they are using Windows or Linux. He also knows that to get them to use Microsoft’s cloud instead of Amazon’s or Google’s clouds, Microsoft has to offer companies a lot of features, including every technology they would normally buy and install in their own database. This certainly includes Linux, particularly Red Hat’s version of Linux. Meanwhile, Red Hat’s rival, Canonical (which makes Ubuntu Linux) was having huge success in the cloud against Red Hat. So it made perfect sense when Microsoft and Red Hat cozied up last November. And the partnership has grown since then. 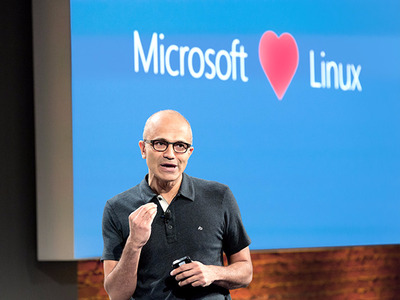 In March, Microsoft even promised to bring its database, SQL Server, to Linux. This week, the two companies are demonstrating the progress of this partnership. They are demonstrating SQL Server on Red Hat. (Linux versions of SQL Server are to be released in 2017). They are bringing Red Hat Linux to Microsoft’s cloud in China. And, perhaps, most importantly, after years of work, the two companies have finally released the promised open source version of Microsoft’s super popular app development platform .Net. This version, called .Net Core, allows developers to write apps for Windows, Linux and Mac OSX, as well as iOS and Android. It was a huge multi-year undertaking involving more than 18,000 developers from more than 1,300 companies contributing, Microsoft says. This project was done in conjunction with Red Hat and a programming tool company called JetBrains. Now that the first version of .Net Core is done, Samsung is joining the project’s technical committee, Microsoft says. The upshot of all of this news: as Nadella continues to turn old enemies into friends, he’s making it easier than ever for enterprises and developers to flock to the company’s cloud.